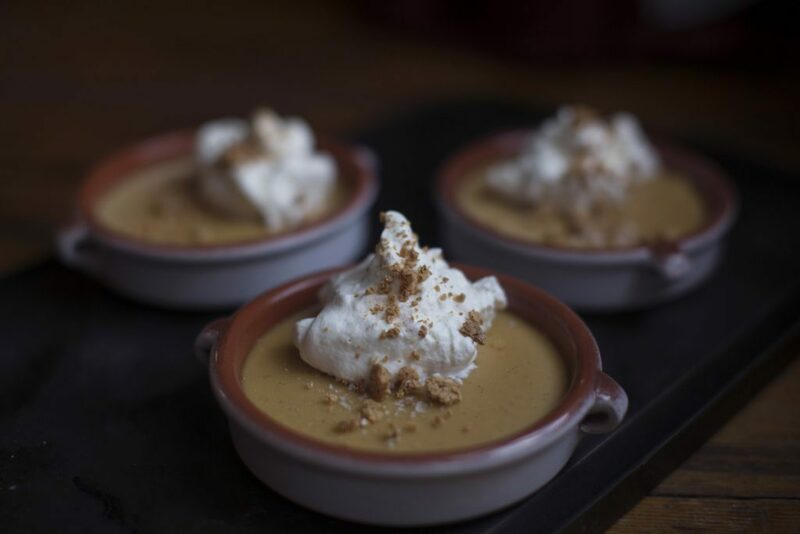 This recipe is an adaptation of pastry chef Alanna Taylor-Tobin’s recipe for Pumpkin-Butterscotch Pudding from her book, “Alternative Baker.” I nixed the pumpkin, used up my slightly soured milk and added some bourbon for good measure. If you don’t have any sour milk, you can make it by adding 1 1/2 tablespoons lemon juice or white wine vinegar to 1 1/2 cups milk and letting the mixture sit 5 minutes before proceeding with the recipe. Whisk together the cornstarch, salt and sugar in a medium saucepan. Add the slightly sour milk, cream and vanilla pod and scraped seeds and bring the mixture to a boil over medium heat, whisking frequently. While you whisk, be sure to scrape the entire bottom of the pot. Once the mixture boils, reduce the heat to medium-low and simmer for 1 minute. The pudding should be the texture of a loose yogurt. Turn off the heat and whisk in the butter and bourbon, if using. Fish out the vanilla pod and divide the pudding among 4 serving dishes. Rinse the vanilla pod, let it dry, and reuse it to flavor a jar of sugar. Chill the pudding until cold and set, about 1 1/2 hours. Serve with a dollop of whipped cream and a sprinkle of flaky sea salt and cookie crumbs.